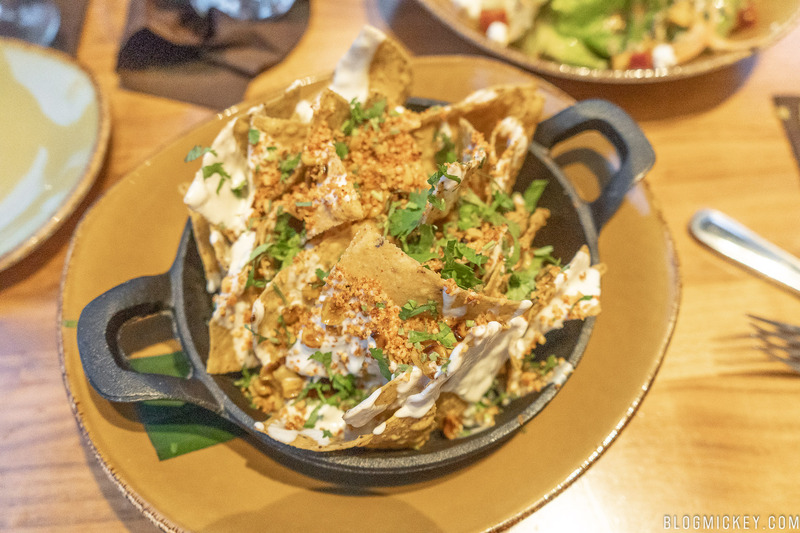 We were the invited guests of Frontera Cocina, but it didn’t affect our opinions shared in the review. 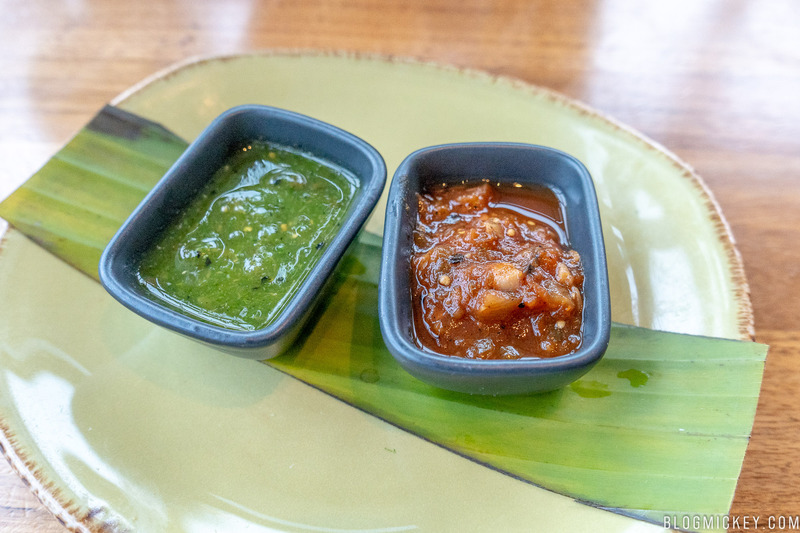 Always flavorful and fresh, the new regional menu features flavors of mango and spice in the dishes. 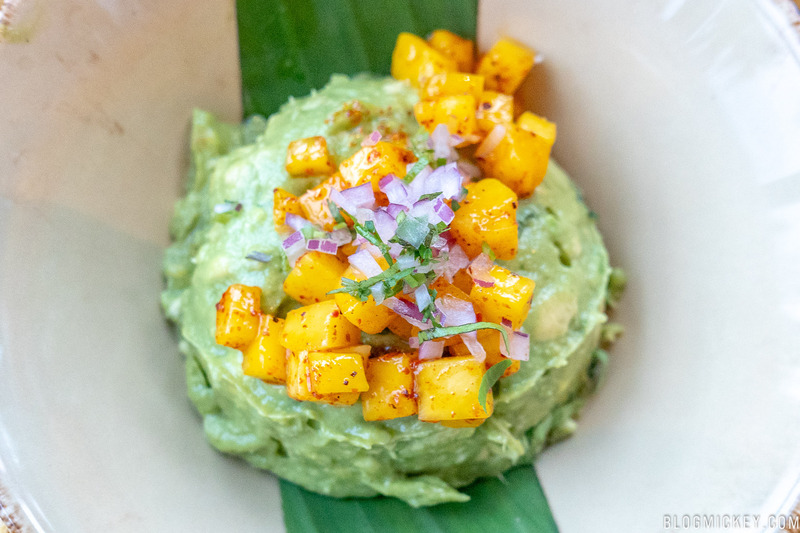 The biggest change to the guacamole isn’t the fresh mango on top, but rather the fact that every guacamole offering is now served with a salsa. For this appetizer, you’ll find the guacamole paired with a smokey chipotle and herby salsa. 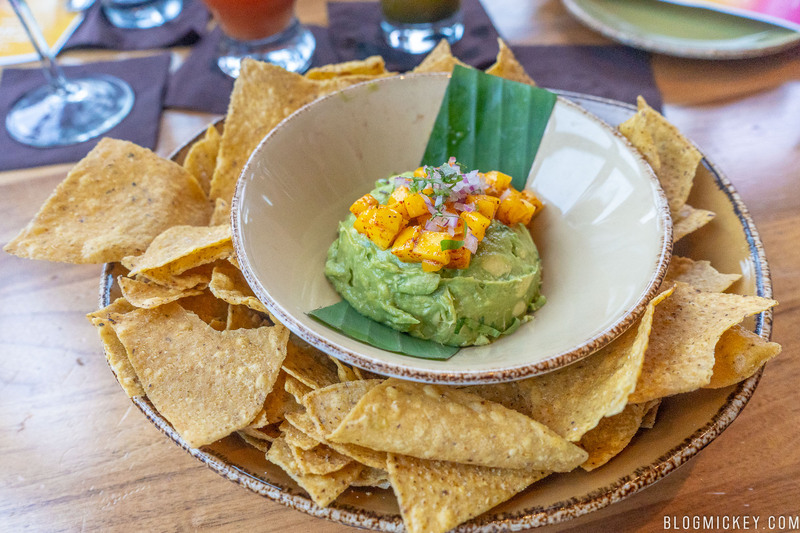 The guacamole itself is as delicious as we’ve come to expect from Frontera Cocina. It’s noticeably fresh and the addition of mango introduces a sweetness to the appetizer that was welcome and different. We found the portion size to be larger than first appearance and it’s definitely a dish that can be shared between two or more guests. 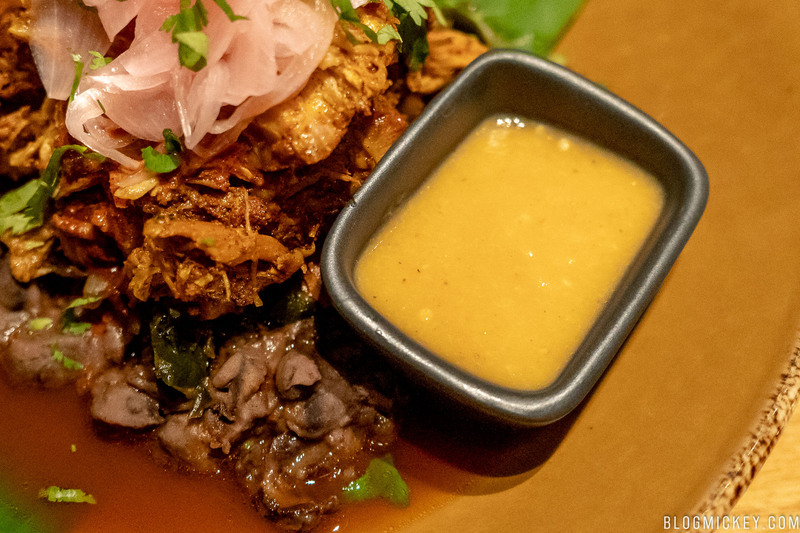 An achiote marinated slow roasted tender pork sits atop a bed of black beans and poblano rajas, the dish is finished with pickled red onions and a fiery habanero salsa. Another dish that might seem unassuming on first glance, is actually packed with flavors. 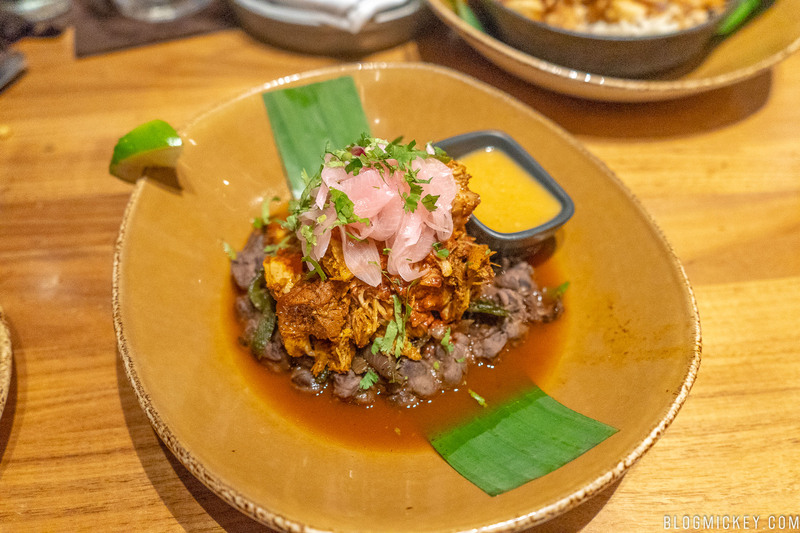 We’ve had the Cochinita Pibil off of the regular menu as recently as our last visit two weeks ago. The difference here is the habanero salsa. It packs a punch, but more on that in a bit. 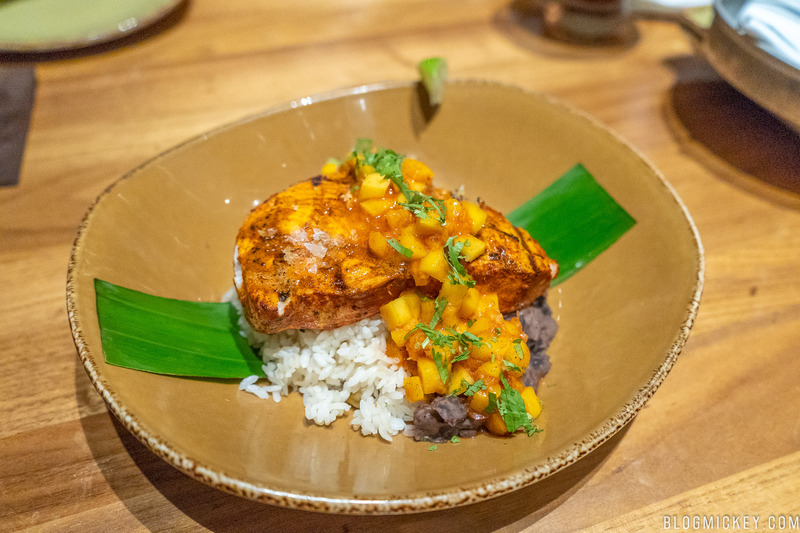 One of the things we’re always pleasantly surprised with at Frontera Cocina is the portion sizes. When you’re visiting Disney and spending $20-$30 on an entree, you want to feel full at the end of the meal. The portion size with all of our entrees was wonderful and on par with the prices we’ve paid on our previous visits. Here’s the habanero salsa. Again, it may seem unassuming at first, but it brought some at the table to tears. That said, it’s a wonderfully spicy salsa. Tread lightly at first and I think you’ll enjoy the kick that this salsa has to offer. The most expensive item on the new menu is, unsurprisingly, the swordfish. 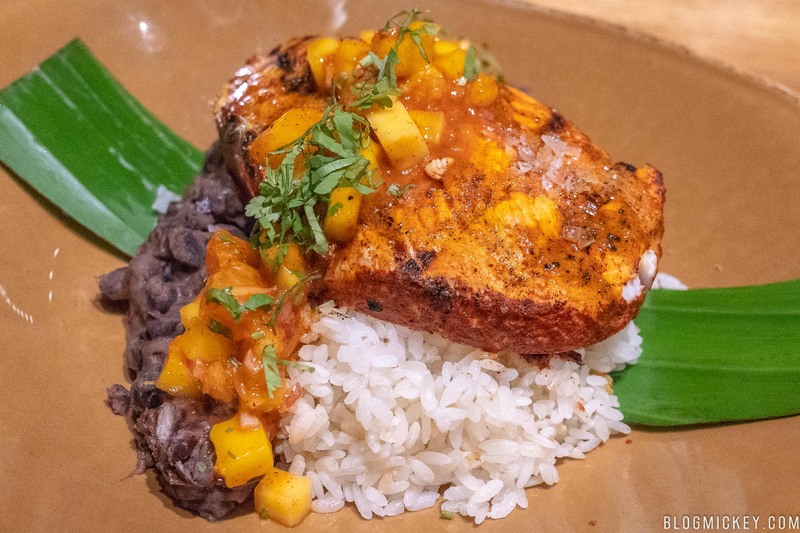 A mango-orange salsa is present, carefully splitting the swordfish as well as plantain rice and black bean refritos in half. 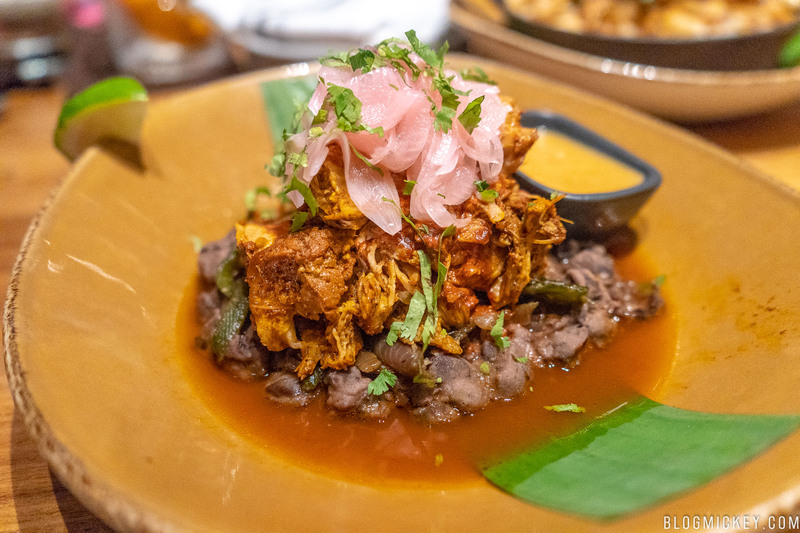 An achiote-citrus butter adds even more citrus flavor with a very subtle spice. The swordfish itself was grilled well. While I’ve seen swordfish described as “steak-like”, I would say that this came out more chewy than flakey, and higher in fat content than you’d find in a steak. Fans of swordfish will find a nicely portioned meal, but we’ll be sticking with some of the other options due to the fatty texture of the dish. 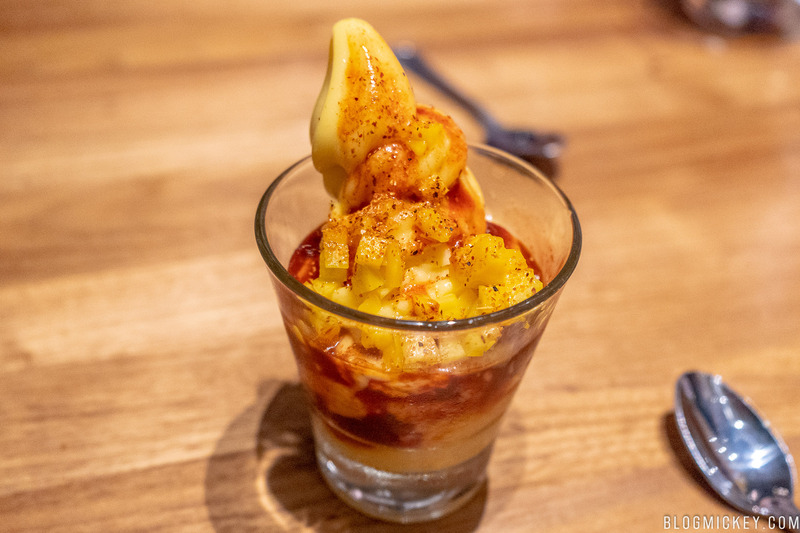 Of all of the dishes presented to us by Rick Bayless and team, the Mango Sorbet with Spicy-Tangy Chamoy drizzle was the one that brought the Chef the most joy in describing. 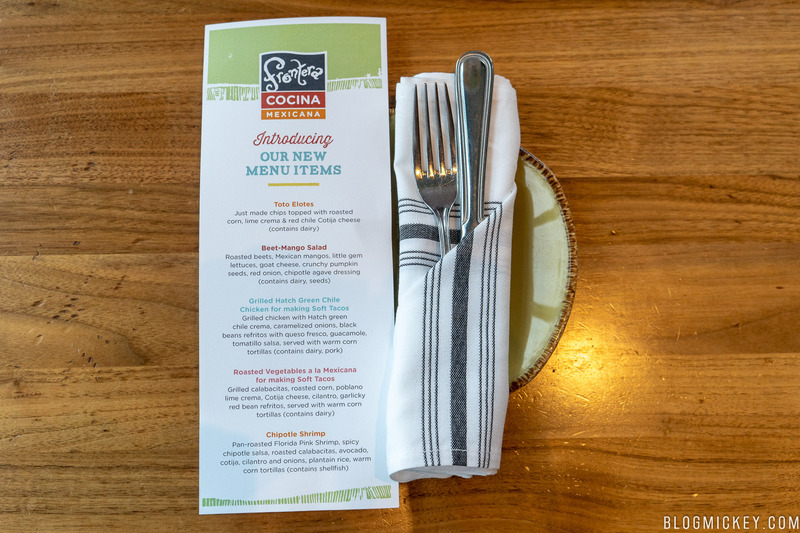 Chef Bayless takes an extraordinary amount of care when sourcing his dishes. 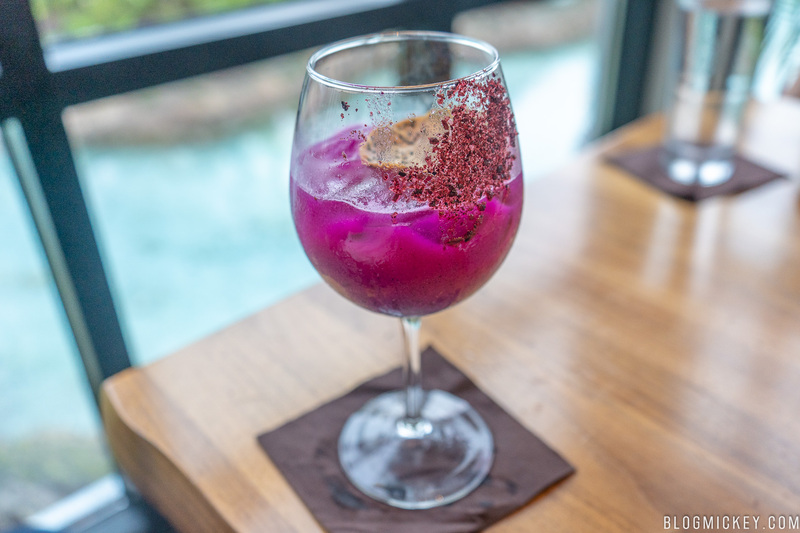 He has spent years working and living in Mexico, so when he was able to present the Spicy-Tangy Chamoy drizzle to his staff, many of whom are Mexican, he was happy to see their faces light up as they were reminded of home. Chamoy has been described as a singular flavor that could most describe Mexico in a bite. It’s equal parts sweet, sour, salty, and spicy. It’s a very unique flavor that might play differently with everyone. For us, it was perhaps a bit too unique to be added to an otherwise traditional sorbet. That said, if you’re from the region, or looking for an authentic Mexican treat, the Mango Sorbet with Spicy-Tangy Chamoy drizzle is the dessert to get. 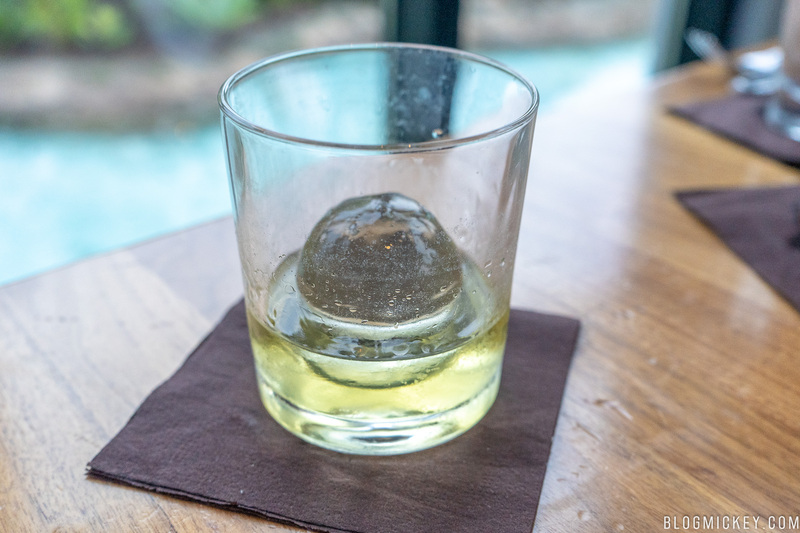 A delicious honey-anise liqueur served with an ice cube. An authentic Yucatan liqueur is made from the anise seed and fermented with honey produced by bees from the nectar of the xtabentun flowers. 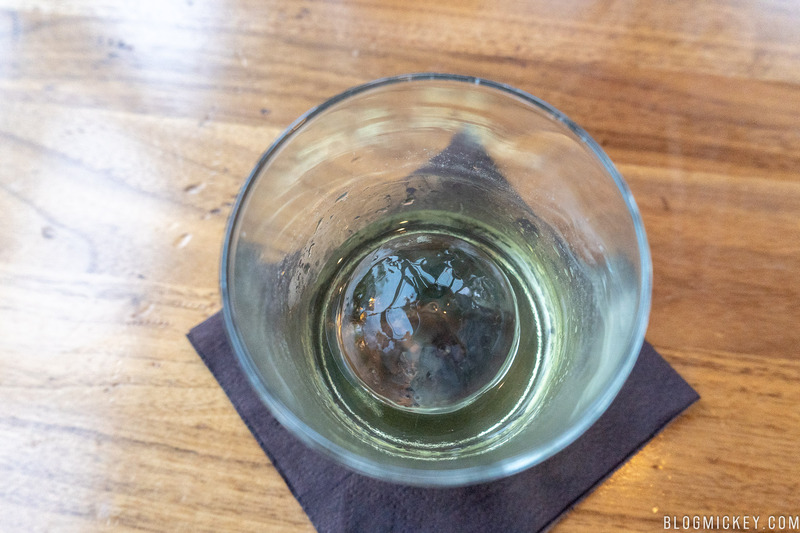 All that is mixed with rum to produce an exceptionally smooth spirit that retained both a honey flavor and aroma. 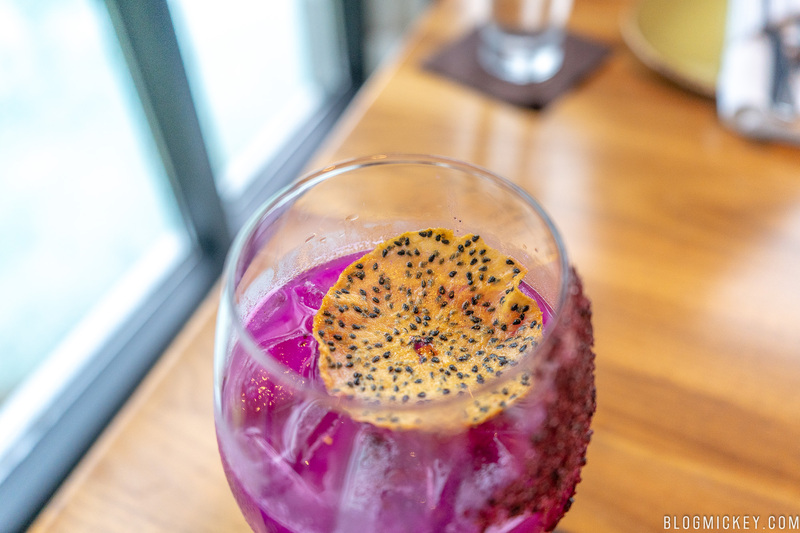 A beautiful looking drink that just didn’t sit right on the palate. It never got to a “fruity” taste and the smoky aftertaste missed the mark for us. 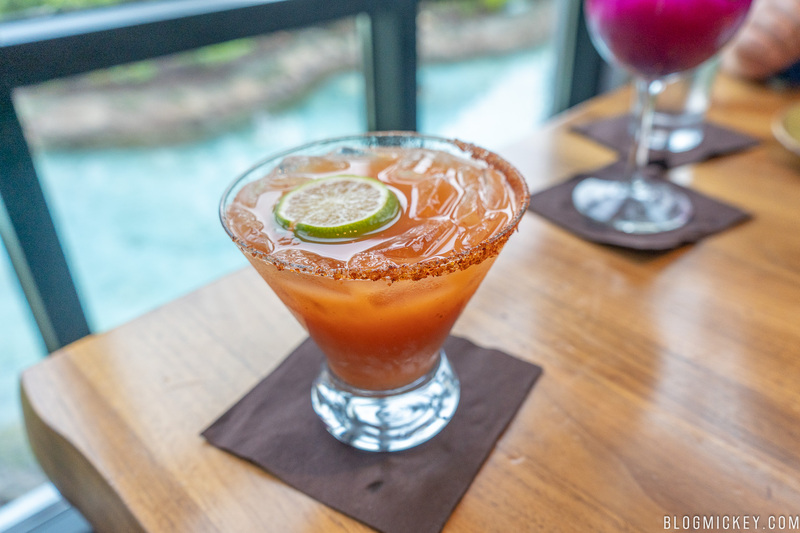 A milagro blanco tequila with achiote cordial, Ancho Reyes liqeur, fresh lime-orange juice, habanero bitters. 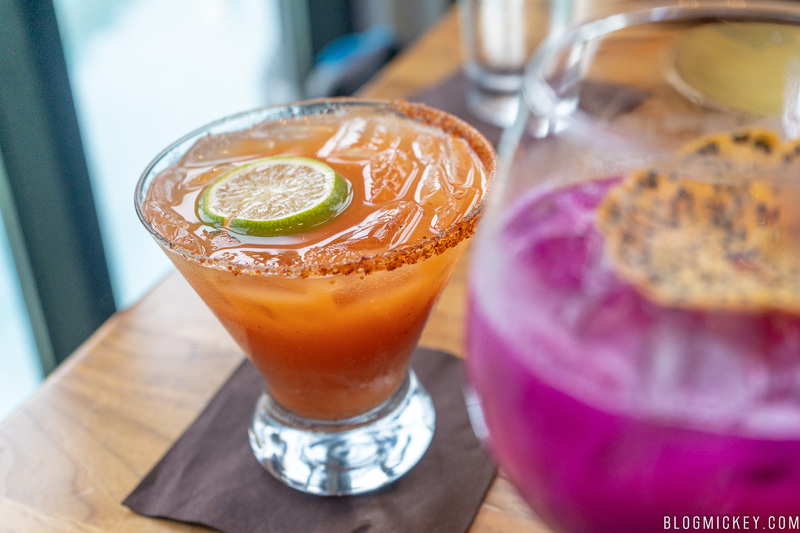 A spicy rim gives way to a bit more mild of a drink. 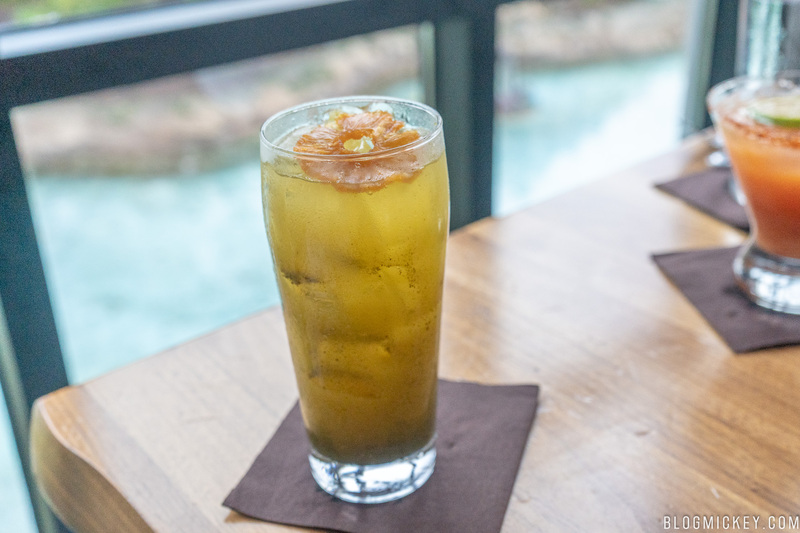 A little bit of lime and citrus comes through, along with a spice and solid taste of tequila. This non-alcoholic drink is amongst the most interesting we’ve had at Walt Disney World. Not because of the taste (largely pineapple), but because of its potentially deadly qualities. As Chef Bayless explained, the raw chaya leaf is highly poisonous. When boiled properly, the leaf loses its acidic toxicity, and it becomes a good source of protein, vitamins, calcium, and iron. It’s also said to lower your cholesterol. The drink itself is non-alcoholic and the $6 tendered doesn’t allow for refills. A relatively common pineapple flavor is backed by quite the story. 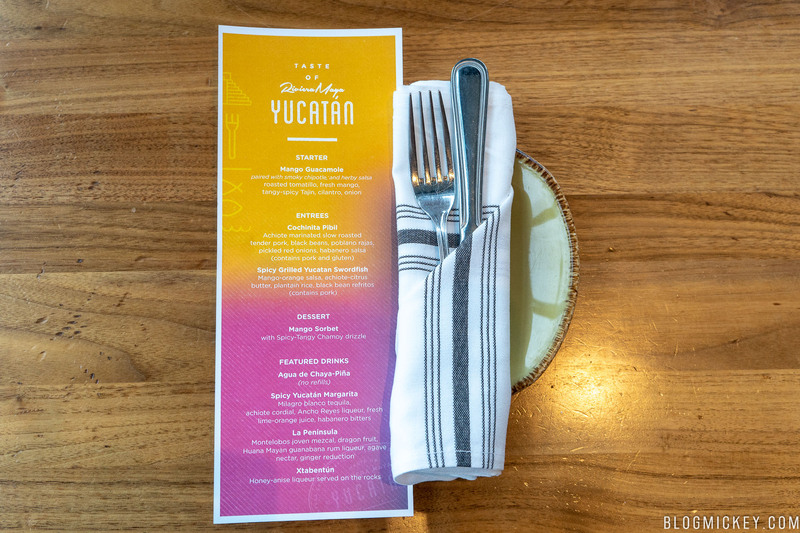 In addition to the Taste of the Riviera Maya Yucatan menu sampled above, we were brought out new items that have been added to the daily menu. These may have been the winner of the evening. “Just made” chips are topped with roasted corn, lime crema & red chile Cotija cheese. As Chef Bayless noted, the dish actually gets better as you progress through it thanks to the excess lime crema and cotija cheese. The chips are notably fresh, but the brilliance of the dish is the lime crema. It’s equal parts subtle and flavorful. 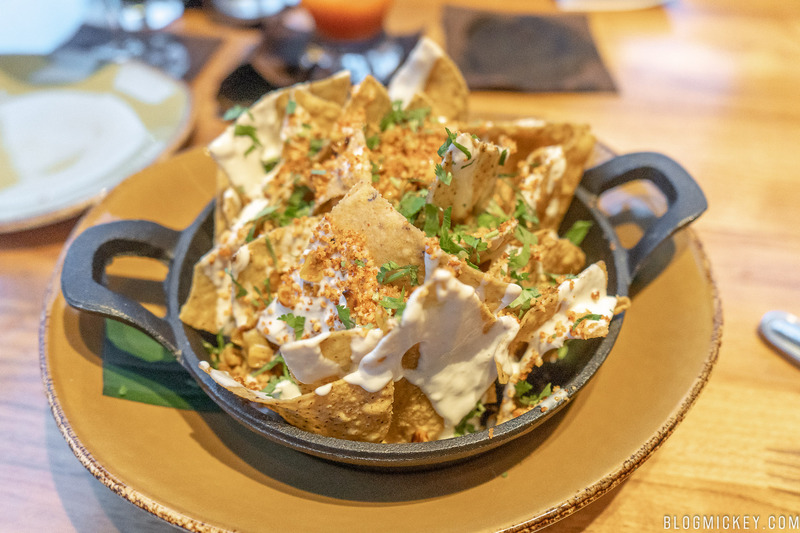 It’s a really unique taste and this will be the appetizer to order at Frontera Cocina. 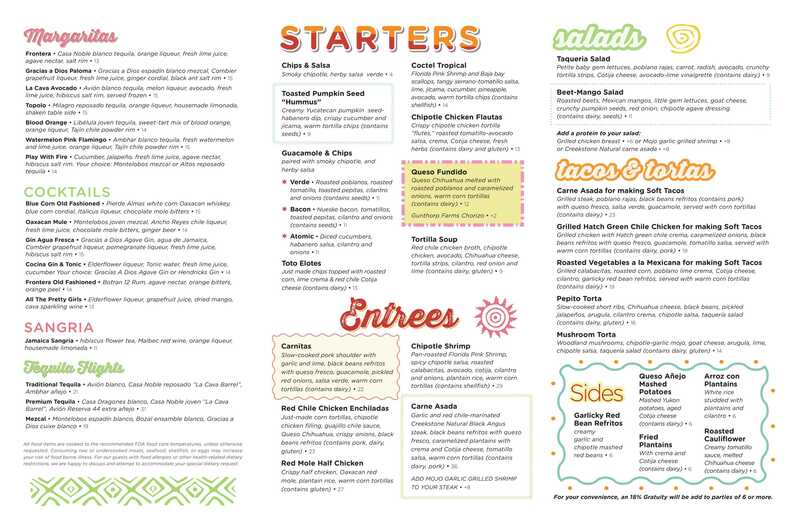 We’re actually really excited that these are on the permanent menu, because we’ll be back to enjoy them often. 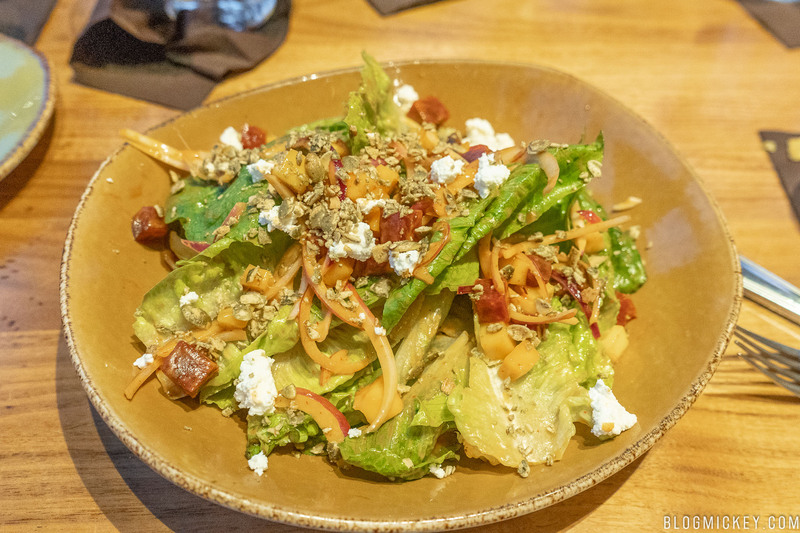 In this salad, you’ll find roasted beets, Mexican mangos, little gem lettuces, goat cheese, crunchy pumpkin seeds, red onion, and chipotle agave dressing. When I think about Mexican food, my mind doesn’t often wander to beets. As a matter of fact, beets have never been a part of my food pyramid. That said, this salad is wonderfully fresh and the chipotle agave dressing is a perfect summer dressing. It’s a busy salad where all parts really work well together. Crunchy elements such as the pumpkin seeds pair nicely with the soft goat cheese. If you’re not looking for a heavy dish, this is a nice option. 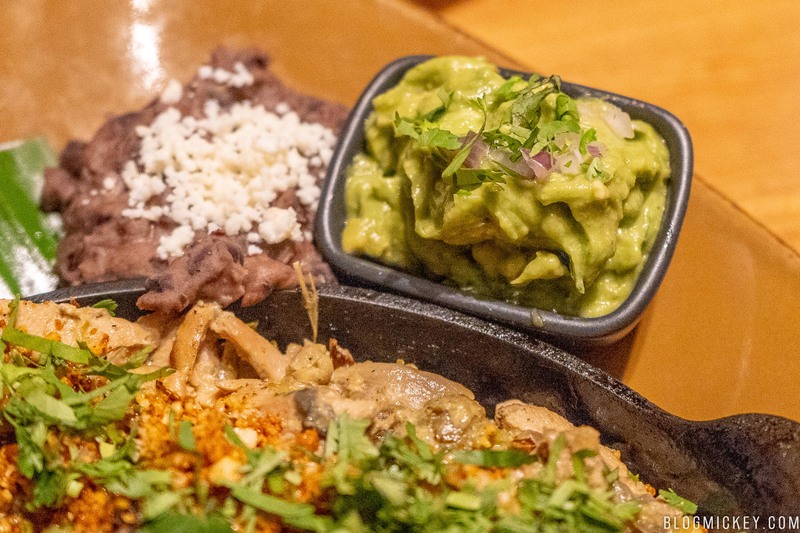 Grilled chicken is delivered with hatch green chile creme, caramelized onions, black beans refritos with queso fresco, guacamole, tomatillo salsa, and served with warm corn tortillas. Another dish with a large enough portion to fill you up, this make-your-own soft taco dish sees some of the best chicken we’ve had. The chicken is soft and is only overshadowed by the hatch green chile creme. 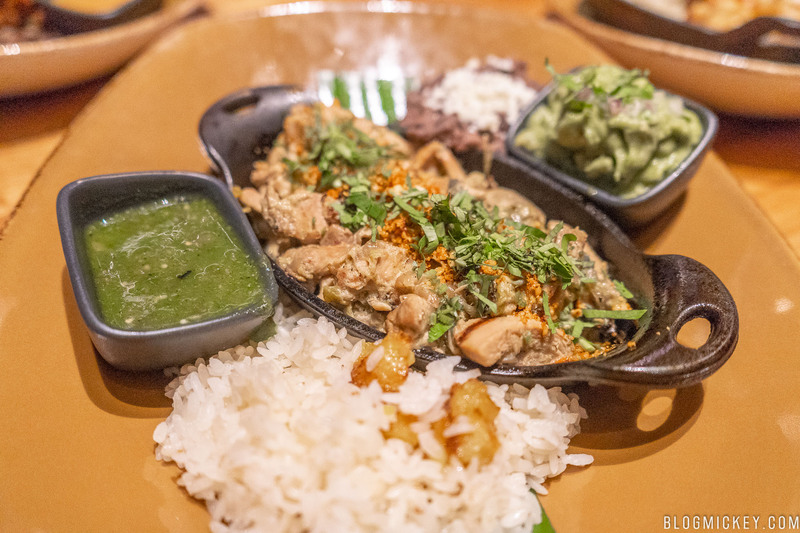 We’ve tried most of the make-your-own soft taco dishes at Frontera Cocina and this fits nicely into the already solid lineup. 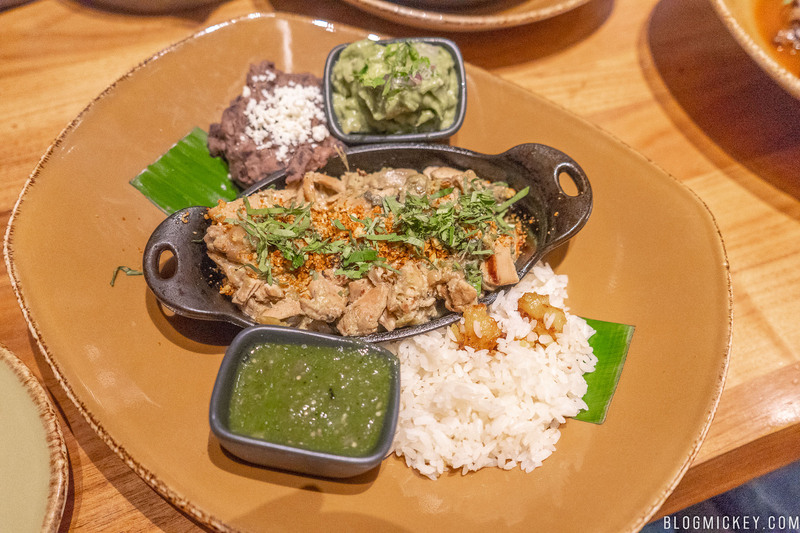 Frontera Cocina does guacamole really well, and this dish is just one of two soft taco dishes that provide a dollop of it. The final dish that we tried was the Chipotle Shrimp. 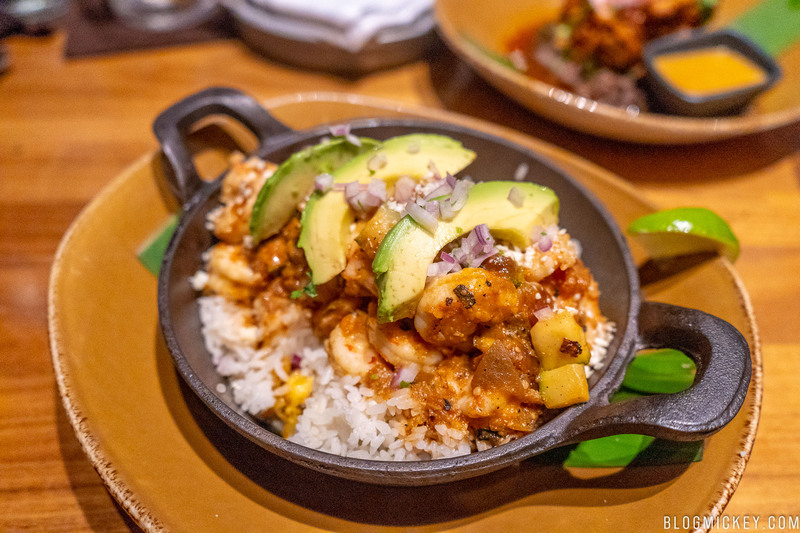 Pan-roasted Florida Pink Shrimp arrives with a spicy chipotle salsa, roasted calabacitas, avocado slices, cotija, cilantro and onions, plantain rice, and warm corn tortillas. The $29 price point is easy to balk at, but this is yet another dish that excels in portion size. I would even venture to say that this could be shared by two people if you pair it with an appetizer like the Toto Elotes above. 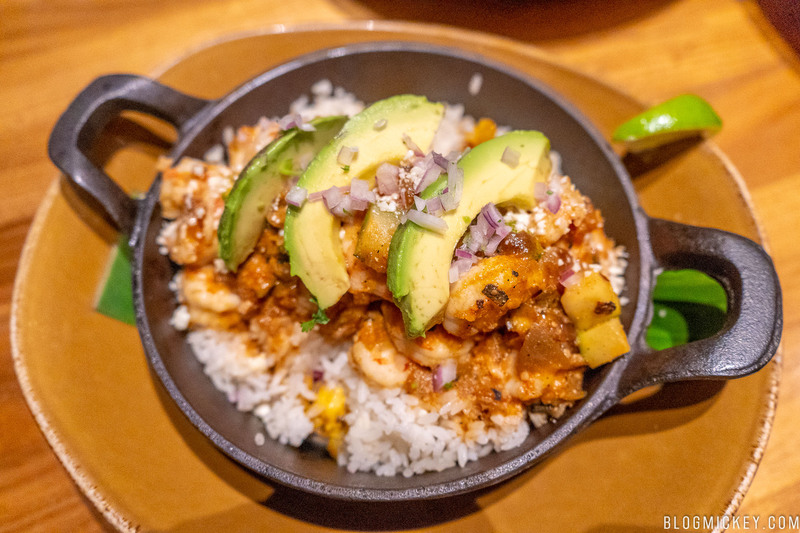 Not shy with the amount of shrimp, this dish contains a little bit of heat with the spicy chipotle salsa. 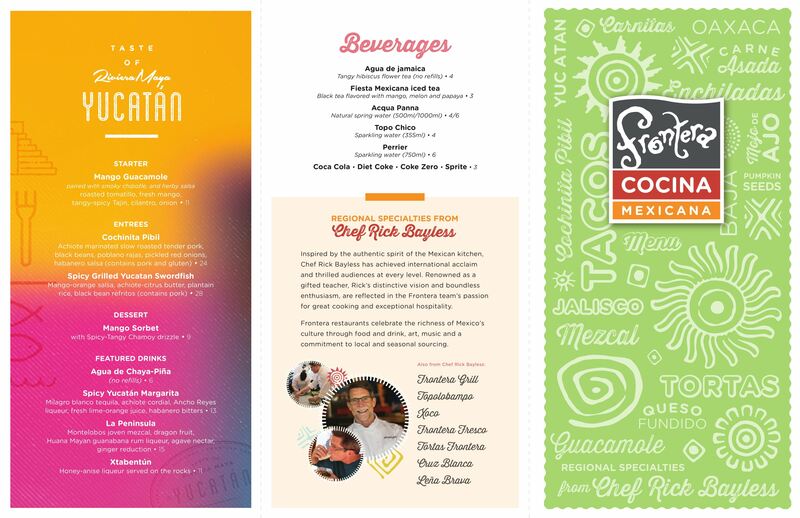 Both of the new menus are now available at Frontera Cocina.